For the most part, my user research and evaluation freelance work comes through referrals. That means I spend my business development time on being visible and present in the UX/tech world, and then work comes through either people who know me personally or who refer me to others who need user research support. After the referral, there is always time needed to spec out the work. Sometimes it’s as simple as validating that what the client thinks can get done within a specified amount of time or budget can get done. Other times, however, it involves a client telling me that they have a general idea of what they want or where they want to end up, but they ask me how to do it and what the budget would need to be. Either scenario is fine and expected. And this overall strategy works for me – I stay comfortably busy throughout the year, and project schedules generally align reasonably well. One thing that I typically don’t do these days is bid directly on competitive RFPs, or Requests for Proposals (although others responding to RFPs sometimes bid me for the research piece of a larger project). 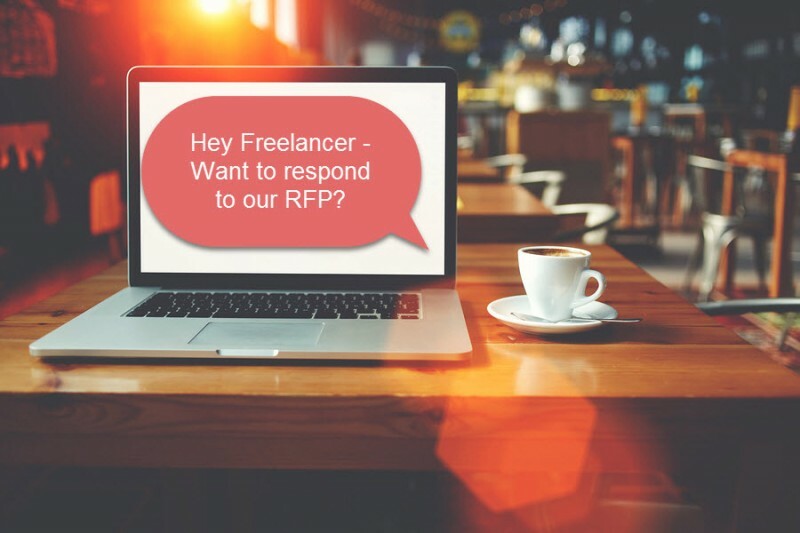 While I have never bid directly on an RFP without being solicited by someone at the target company to do so, I can recall doing even just that only 3 times in the past 8 years as a freelancer. Each time I had to spend a day or two responding to the RFP, asking questions as needed, and presenting the required information. None of these attempts were successful. When following up after the first instance, I learned that there was an incumbent company doing the user research. Although the boss asked the key product stakeholders to see what else was out there and specifically asked them to ask me to bid, the product stakeholders weren’t particularly interested in switching the research provider and eventually made the case to the boss that what they had was fine and they didn’t want to mess up their existing process with something new. In the second instance, I learned that the winning company offered internal participant recruiting plus a dedicated project manager separate from the research team, which were both big pluses to the decision makers and something that I couldn’t offer. And the third instance was apparently a matter of price – where price was one of the most important criteria so they went with the lowest-cost option, even though this likely meant less experienced staff. Larger companies than me often have people who are tasked with responding to RFPs. Those people are often not bidding themselves but are bidding team members that they match for appropriate skillsets, “fully burdened” labor rates (e.g., how much do they cost the company if they were to sit idle), and expected availability. Responding successfully to RFPs takes experience: I’m sure that those companies (and specific people at those companies) who respond to RFPs regularly gain experience from the routine effort. They learn how best to frame work to get the winning bid, how to ask all the right questions and how to glean insights from what isn’t said. For those that do regularly bid on RFPs, this strategy can be quite successful. This is certainly harder for a microbusiness that doesn’t respond regularly to RFPs. Project work gets in the way: As a freelancer with a microbusiness, while I certainly allocate some time to business development, being able to respond quickly to RFPs is difficult while I’m doing actual project work. Always bidding myself: My business structure is such that I’d always be bidding myself for somewhere between half and all the effort on any given project (where other people on the project would be the one person on staff and occasional subcontractors). I do certainly have some flexibility to adjust my rate a little if needed, however larger businesses can also modulate people to match necessary levels of experience needed for a project. This can help in winning RFPs that put a high value on overall cost. A new referral: What to do? Two weeks ago, I was in the midst of a three-city trip – a conference in Toronto, some usability testing near Seattle and then a design critique workshop in Atlanta. I got an email from someone at a company that produced a product that I personally used and enjoyed. The email told me that she was looking for responses to a recent RFP that was due in a little over a week. She also let me know that she was asking me because she had gotten a good referral for me from someone else. I struggled for a moment because I really liked the idea of being involved with this particular product, but I quickly came to the conclusion that it didn’t make sense for me to respond. Not only did I recall my past lack of success with similar situations, but I truly had no spare time to work on the RFP. So I responded with an apology that as a busy freelancer, I just didn’t have the bandwidth to submit a proposal. I kept thinking about this project, however, and that even though I didn’t have time to respond, I wasn’t happy with myself for having rejected this project. Eventually I realized that what I should have done was find a partner that was bigger than me, share the project with them, and let them respond and use me for a portion of the project. I let the requester know that I had been thinking about it, and rather than saying no, should have instead found a partner that could respond and then use me on the project. She agreed that this would be okay although she asked that I identify the partner first. But time had passed and I was busy with work, so by the time that I had found a partner a day later and emailed her, she let me know that she already had six companies committed to bidding, so she didn’t want to involve yet another. My lesson learned was to have a standard strategy in place for dealing with the occasional referrals to respond to RFPs. I still believe that for all the mentioned reasons, it doesn’t make sense for me to respond directly to a competitive RFP. However, next time, if the project sounds good, I won’t say no. Instead, I will quickly involve a partner that best makes sense for a given project and let them take the lead on the project proposal. I’d also challenge that businesses who use RFPs for UX services should consider that they are often not going to get those freelancers and microbusinesses to respond. While there are certainly larger consulting agencies around, freelancers and microbusinesses can offer personalized service with a single, consistent and very-senior-level point of contact who can manage the small UX project, plus do all or at least much of the work and be the key person to interact with the stakeholders. Businesses that produce RFPs could ask themselves whether RFPs are needed for the smallest of projects – maybe more formal requests could be reserved for larger efforts. Or maybe the smaller efforts could have RFPs that require less of a response than the larger RFPs that require a more significant time commitment. The recent request situation had me thinking a lot about RFPs. Since I’m not seeking them out, however, I don’t expect to be asked about another one anytime soon. Meanwhile, I’ll continue to enjoy my standard business development approach – and one that is easier as a freelancer – staying visible in the wider UX world. And I’ll certainly continue to write up proposals when asked to do so for existing clients – but only in cases where they’ve already largely decided to use me as their freelancer and I’m now explaining the work and providing a cost estimate. Do you want to be a freelancer too? Even nine years in, being a freelancer continues to be both fun and an ongoing learning process. Are you interested in being a freelancer too? Check out my two new LinkedIn Learning courses on being a UX freelancer: Freelancing and Consulting in User Experience and Strategies for Successful UX Freelancers as well as my course on Planning a Career in User Experience and my recently published book: The UX Careers Handbook.